It has been hot hot hot this week and so baby boy and I have been making the most of it. 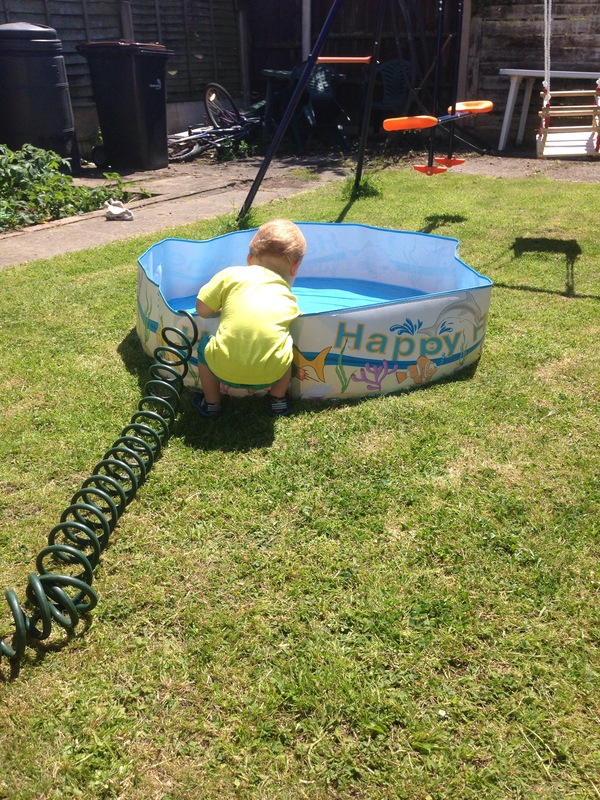 We have spent most of our time in the garden with the paddling pool out. Baby boy has loved being free to just run around although this has often meant me running after him to stop him tormenting the dog, pulling up strawberry plants and various other mischiefs! At one point I had to remove a snail from his mouth, yuk. It has been warm enough for him to mainly just run around in a nappy (which makes me glad he has such pretty ones). This has meant lots of sun cream – ours smells of ice cream- and lots of arguments putting the sun cream on. He seems to like the idea of having it on but as soon as I spray it he tries to run away. I have loved this week. It has been relaxed and fun. Long may the nice weather continue! April, I hope that you had fun with the water balloons. They sound like great fun!